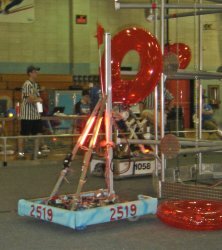 The 2007 Challenge, “Rack ‘N’ Roll,” (2007 FRC Game Animation) began on January 6. The field revolved around the main scoring structure situated in the center of the field. Three rings bearing spokes for scoring hung from chains suspended from the central scoring structure. The implements of scoring were inflatable plastic pool tubes. The different types of tubes were called “keepers,” which were placed on the spoked racks only during autonomous, and “ringers,” which were utilized during tele-op and the endgame. “Spoilers” were muted black tubes that could be placed over ringers to cancel opposing teams’ points. The object of the game was to place ringer tubes in both horizontal and vertical rows. To add variety to the game, spoilers could be positioned to deactivate a row of ringers. Interestingly, these spoilers could be relocated at any point of the match. In the endgame, robots race to their secure home zones to receive bonus points for each robot elevated off of the floor. The height of the stack determined the value of the bonus. We analyzed the game and concluded that it would be important to have a robot that could both score tubes and provide a ramp mechanism for lifting other robots. 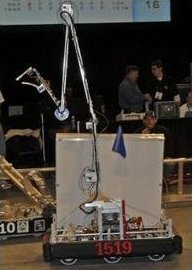 We developed a robot design which we hoped would score tubes on the rack for the majority of the teleoperated period, then toward the end of the round, deploy two lifting ramps. Unfortunately, our design proved to be too complicated, and neither the arm nor the ramps worked properly when we shipped it. In spite of massive efforts while at the Granite State regional, we found ourselves resorting to defensive play, much like we had done in 2005. We went the whole tournament without scoring any points at all except for once climbing a 4-inch ramp. Our defense was often effective, and ironically we went 7-1 in qualifying, and secured #3 seed. We allied with Gael Force (team 126) and the Devil Dawgs (team 549), who both valiantly battled to make up for our lack of scoring punch. But we went down in the quarterfinals in 3 matches. “ankle biter” in one round for a team that arrived late (amusingly, it was on the winning side!). The primary robot continued to play defense, and missed the playoffs. second robot. Team 501 and our primary robot finally won through a brutal and bizarre series of playoffs. In the two weeks before Battle Cry we decided to merge the best features of the two different robots. The second arm was moved to the primary base, and yet another “plamp” design was crafted. At Battle Cry we again found ourselves leading an alliance, but this time our robot could both score tubes and lift other robots. After Battle Cry the team said our goodbyes to several key seniors who headed off to college. One now works with Gompei and the H.E.R.D. (190) at WPI, and another is mentoring the RoboLobos, a team starting its rookie year in Edmond, OK.
Our 4th off-season tournament was Bash at the Beach. Only a few of us went because of the drive but we had a good day, finishing 4th seed and being eliminated in the semi-finals. The robot worked well all day with only one hiccup and we were 5-1 in the qualifying rounds. Our alliance’s high score was 9 tubes, of which we scored 5. We did this more than once and on one occasion we were agonizingly close to scoring a row of 8, but we had to settle for 7 instead. Such a long way from the defensive play at GSR! At River Rage we finished as the #3 seed with a record of 5-1 and picked teams C.H.A.O.S. (131) and The Cardinals (811). We made it through to the finals of the winner’s bracket, dropped to the finals of the loser’s side of the bracket, and then battled to two ties before succumbing in the third match with the eventual champions. Our robot broke two wheels during the tied matches, and had to finish the last match with one corner propped up by a rubber mallet! Much praise to our partners who gave it all they had also!